Popular Backwash Shampoo System with Cella Chair. Features heavy-duty Matte Black laminated plywood chassis for long-life, oversized black porcelain shampoo bowl that tilts, and seat-slide adjusts chair front-to-back. 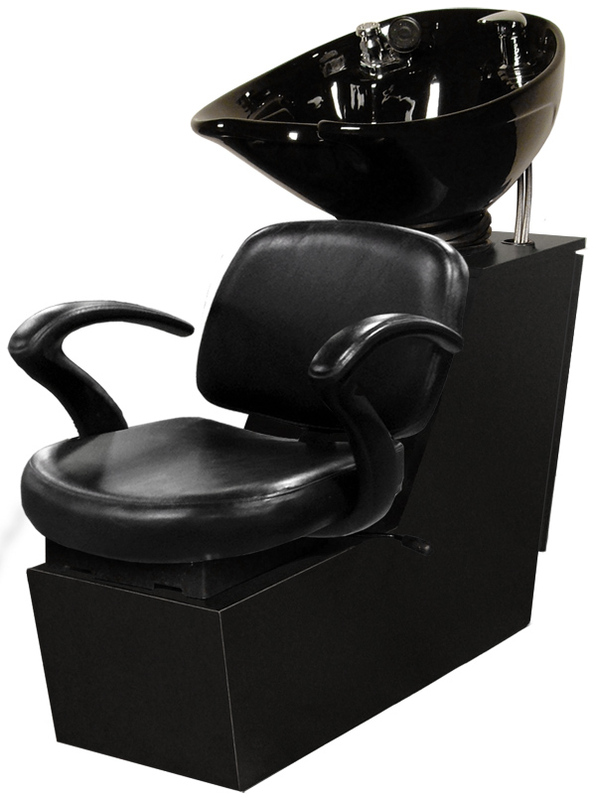 Black bowl with 570 fixture, spray hose, tilt-mechanism, strainer, drain, vacuum breaker, and flexible tail stock. Choose from five standard vinyl colors Black, Charcoal, Grey, Scarlet, or Chocolate. Chassis in black only. Units are typically installed on 32" centers with the plumbing coming from the floor. * Salon Price is the price typically charged by Jeffco distributors but does NOT include shipping.